Early trailers for "Rogue One: A Star Wars Story" promised a work in the vein of "The Bridge on the River Kwai," "The Magnificent Seven" and "The Dirty Dozen"—impossible mission movies that weren't afraid to kill off the vivid characters they created. This film about a band of misfits stealing the plans to the first Death Star is that kind of work. It culminates in a thunderous final act that weaves together the most impressive space battle in the series with a prolonged ground assault on an Imperial fortress in which casualties have both physical and emotional weight (which is something "Star Wars" was never big on). But it also bridges the fairy-tale despair of the prequels to the rah-rah idealism of the original trilogy, spackling decades-old logic holes as it goes along. (Chris Weitz and Tony Gilroy's script even retro-engineers an answer to the question of why the Galactic Empire would build a super-weapon that could be vaporized with a single well-placed shot.) "Rogue One" is a letdown in other areas, and there are creative decisions so ill-conceived they take you out of the story. But somehow these aren't enough to sink the movie, which manages to succeed as both super-nerdy fan service and the first entry since the 1977 original that will satisfy people who have never seen a "Star Wars" film. "Rogue One" was directed by Gareth Edwards, whose 2014 "Godzilla" was one of the most daringly conceived blockbusters of recent years, so much so that some viewers found it frustrating and pretentious. This one is more conventional, from its clockwork storytelling to its relentless, brutal postscript (which I bet is where a lot of Disney's reshoot money went). But the film still has enough moments of beauty and terror to mark it as the work of an artist rather than a glorified craftsman. A Death Star "test" on a single city is more horrifying than any similar attack in the franchise because we see how the battle station's green rays tear up the land, creating tidal waves of earth: a cross between an earthquake and a tsunami. The space battles make the odd physics of "Star Wars" seem as comprehensible as 18th century flotillas clashing in a bay near a port; there's even a combination tugboat-torpedo that can drill into the hulls of enemy starships and push them to one side. Smaller, more intimate action scenes have a tactile sensibility as well. Rain, fire and wind have a fullness and weight rarely seen in CGI-heavy fantasies. When characters scamper up ladders or navigate wet, crumbling cliffs, you flinch, because Edwards makes you fear minor cuts and bruises as keenly as maiming and incineration. Darth Vader makes a couple of appearances—both chilling; and how grand it is to hear James Earl Jones' rumbling baritone once more—and there's a rubbery digital Grand Moff Tarkin puttering around the Death Star bridge as well (I don't know if I should say he's played by Peter Cushing; how to refer to a bunch of ones and zeroes badly imitating a dead man?). But the main heavy is a bureaucrat: Orson Krennic (Ben Mendelsohn), Director of Advanced Weapons Research for the Imperial Military, which is a fancy way of saying "the guy who bosses around the scientists actually creating the Death Star." Krennic, played with a bitter, resentful edge by Mendelsohn, has a long-ago connection to Jyn that turns "Rogue One" into a slow-fuse revenge flick once all the details are laid out. But most of the film is conceived as a galaxy-spanning chess match in which individuals, groups and whole fleets either move themselves or are moved against their will. In observing these movements, "Rogue One" conjures a spiritual vibe that makes its action sequences feel like more than a collection of spectacular moments. "Star Wars" always had a bit of this quality—it probably announced itself when Luke lowered the blast shield on his helmet in "A New Hope," and reached its peak with Luke shaming his father in "Return of the Jedi"—but it has never been woven throughout any of the films as consistently as it is here. Characters are constantly being asked to take physical or figurative leaps of faith, whether they're jumping from one side of a metal abyss to another or deciding to believe a character that says he's on their side but might be a spy. Chirrut's Jedi incantations during moments of jeopardy ("I'm one with the Force, and the Force is with me") define him as a holy man who keeps picking up and reassembling the shattered pieces of his faith no matter what occurs. His pal Baze mocks him, but never too harshly, because he envies the blind monk's devotion to higher powers that he literally cannot see. Some overly familiar character motifs get a workout as well, including the cynical antihero's secret desire to join a crusade and the wounded child's wish to redeem a corrupt or neglectful parent. The latter aren't foregrounded in a self-conscious way, as they were in "Star Wars: Episode VII - The Force Awakens," a movie that transferred its anxiety about rebooting a 38-year old franchise onto new characters who were all obsessed with outdoing the icons that preceded them or fixing their mistakes. The "Rogue One" characters' personal issues take a backseat to the mission, which happens at such a grim point in the galaxy's history that, to paraphrase "Casablanca," the problems of any one being don't amount to a hill of beans. That sounds like a wise strategy, and in some ways it is. But it also ensures that "Rogue One" fails to define its liveliest characters in ways that would make them pop. This is one area in which "The Force Awakens" is a better movie. Even when J.J. Abrams' plotting in "The Force Awakens" was haphazard, or too blatantly leaning on recycling or nostalgia, Rey, Finn, Poe and Kylo Ren were written and acted with such affection and wit that they seemed like worthy, or at least promising, additions to the series' overstuffed pantheon of characters. 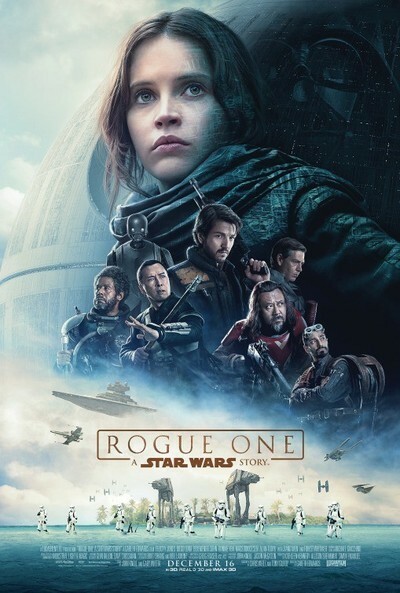 "Rogue One" is so devoted to its multilayered, fast-moving plot that it can't afford to give its characters the breathing space they need to come across as a great team, as opposed to a bunch of strangers who work pretty well together despite ungodly pressure. And the two most important members of the group, Jyn and Cassian, are the least defined, which means that their emotional peaks near the end of the tale are merely affecting when they ought to be deeply moving. (This is a rare all-things-to-all-people blockbuster that might've benefited from being a few minutes longer, provided the time was spent fleshing out relationships.) Nevertheless, the sense of all these individuals struggling to assert their values in a cruel universe comes through loud and clear. That so many characters have been pushed to the margins of galactic life or banished themselves there after a soul-crushing disappointment gives their decisions a grave, poignant quality that's lacking in other "Star Wars" movies, even the good ones. "We've all done terrible things in the name of the rebellion," a character says. The film adds much-needed shading to the the Rebel Alliance, which has both moderate and "militant" elements that don't trust each other and often work at cross-purposes. The military leadership argues about whether it's better to be aggressive or cautious; the Imperial generals and bureaucrats debate tactics as well, and the question of whether it's better to ask forgiveness or permission comes up more than once. George Lucas and his collaborators were always aces at world building even when their storytelling failed, but this is the first entry in the saga that convinces us that its characters live in an actual civilization, with rules and traditions and a sense of history (and a religion) that they measure themselves against. ("The force moves darkly around a creature that's about to kill," one character informs another, anticipating a betrayal.) "Rogue One" also gets into the question of whether it's morally acceptable to surrender or simply give up when you're too tired or broken to fight. Its conclusions are more nuanced than you might expect. The Force may be with you always, but there are times when its weight feels like too much to carry.